Lionel Messi has been praised by the Twitterati after the Argentine displayed impeccable sportsmanship to tell the referee that there was no contact with Osasuna defender after going to the ground during the Saturday's match. 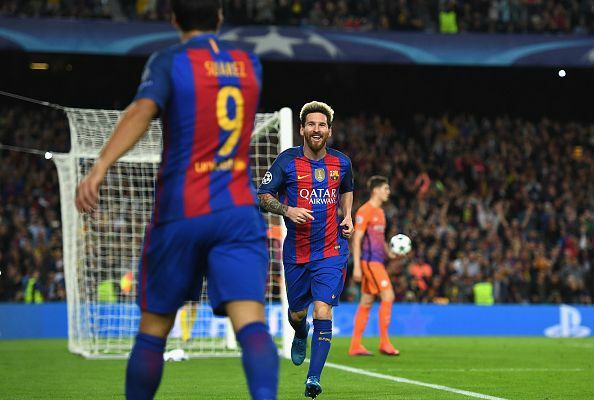 Messi also scored twice and set up Luis Suarez in Barca's 3-0 victory. Many defenders in the world already know that it is extremely difficult to man-mark Lionel Messi and on many occasions, there is no option but to bring him down by unfair means. This strategy too seldom works as the little magician stays on his feet on most of the occasions. During Barcelona's La Liga clash against Osasuna, the referee halted the play to award a free kick to Barca when defender Miguel de las Cuevas seemed to have tripped the forward few yards outside the penalty box. But before the referee could point to the spot, Messi immediately turned to indicate that there was no contact with the defender and asked the official to allow the play to continue. Needless to say, Twitter bowed down to the little genius' fair play. Messi told ref there was no foul. What a gesture. Messi just went down too easily and told the ref not to give the free kick. Messi falls and turns to tell the ref no sir not a foul. Wow. Messi capped his performance on the day, with this insane goal taking out four defenders.